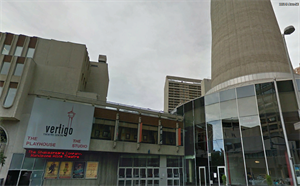 We recently had the occasion to visit Vertigo theatre where a friend was involved in a musical production taking place that evening. This provided an unexpected and unlikely opportunity. After watching the show we visited with this pal who invited us to see the backstage area. While having a look about, we discovered a concealed and obviously seldom used hatchway. With gentle encouragement the panel popped open, exposing a narrow and shallow corridor that traveled far enough along that we couldn't tell where it ended...at this point, curiosity got the best of us and we proceeded down the passage eventually coming to another manhole style door. This opened grudgingly and we found ourselves in the stairwell that leads up to the height of the tower. At this point, there was no holding me back and we proceeded to ascend the stairs, eventually arriving at the observation deck. From previous logs, I knew that the cap was accessible from this area, so putting both fear and good judgment aside, we ventured forth to the access point and ultimate success. An most excellent challenge fulfilled. Thanks for the most interesting adventure ofth!